Nikia Dyson's Motivation And Inspiration! There's nothing more inspiring than a woman who keeps her family functioning by being in multiple places at once like Superman. Does Nikia get her power from the sun or is it simpler than that? There's not much more inspiring than a full-time wife and mother who keeps her family functioning by being in multiple places at once like Superman. Well that describes Nikia Dyson to a T, and what's equally impressive is that she has a body of steel like Superman too—how ironic! Nikia is a super-mom who not only juggles the day-to-day life of her husband and four children, but she also finds time to take care of herself through fitness – her body looks like she's never even thought about having a baby. Now if that's not inspirational, we don't know what is! 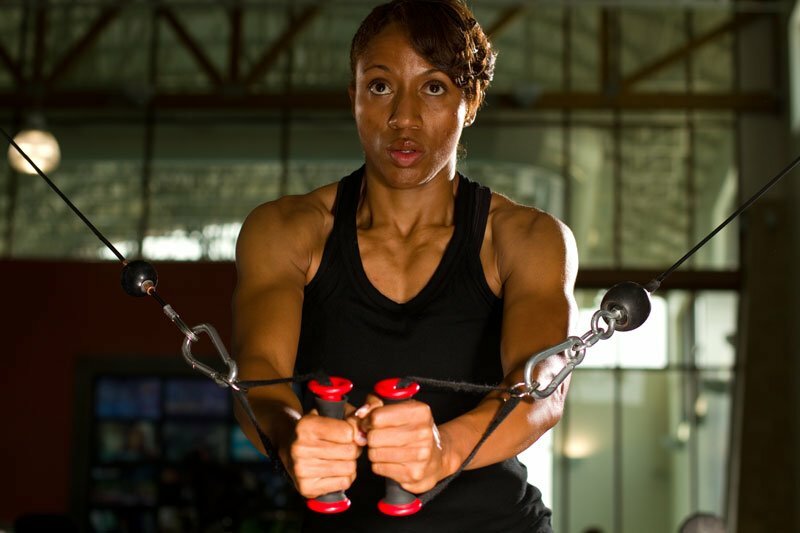 See what keeps Nikia motivated and inspired to maintain such a high commitment to fitness day in and day out. After giving birth to my fourth child in 2008, I realized that the weight didn't come off as quickly as with my other pregnancies. Some of the weight lingered, and I didn't feel comfortable with myself. In 2009, I started my weight-loss journey and managed to keep the weight off, but without any type of structured training or routine. In 2010 my husband (Trelas Dyson III - Tdyce on BodySpace) started his personal journey and started transforming his body in an amazing way. He started working out, eating clean and was completely committed to this new way of life. Every day he displayed what hard work and true commitment/dedication could result in, and this inspired me. His example set the foundation for me to strive for something better in my health, and so transforming my body became the only option. Continual inspiration has made this diced duo unstoppable! When I initially started this challenge, I decided I wanted to make a physical change, but as I evolved in my training it became so much more. Committing to a lifestyle of eating healthier and training has not only been for my own benefit, but it has extended to my family, my children and those that I interact with on a regular basis. I now fully understand that no one but yourself can motivate you. It has to start from within; you have to be the one to set a goal and go after it regardless of your circumstances. In addition to my husband, my children inspire me to do better. I know that they depend on me and need me in good health. I lost my mother when I was 16-years old, after she opted to have a gastric bypass surgery performed. Losing her at such an early age to something directly-related to her weight has always been on my mind. Having my own children, I realized that I need to do everything in my power to be in good health for them. If I am un-well due to my own negligence or choosing to live an unhealthy life, I am directly affecting them. I desire to live my life as an example for them to model. As always, I strive every day to be a better me - a better Christian, better wife, better mother, simply a better person. I strive toward excellence in all areas of my life. I will continue to works toward being disciplined, and I desire to truly be a good person overall. Somebody's in the zone—this is what determination looks like. Many thanks to Bodybuilding.com and Optimum Nutrition for such a wonderful opportunity! 1. Set goals with a specific plan and visualize the end. Before starting any training program you should have a goal in mind (12 weeks training goal, to compete, lose body fat, etc). Detail your plan of action so you are completely prepared and practice visualizing your end results (you actually achieving the goal). 2. Track progress. Just as important as it is to set goals, you must track your progress. Tracking your progress will help you push harder each day, because you will constantly strive to outdo the last. In addition, this will also help you recognize your changes, growth and where you have come from. 3. Find a source of inspiration that you can go to each day and rely on. For me it was husband, my children, and a quote I repeated each day when I woke up, during my training, and throughout the day. "Desire is the key to motivation, but it's the determination and commitment to an unrelenting pursuit of your goal - a commitment to excellence - that will enable you to attain the success you seek. 4. Practice discipline, drive, and determination. Never forget the three Ds of Dyson fitness. 5. Understand that every meal plan and workout is not for you. We are all created differently. Choosing to live a healthy lifestyle with clean eating and training should not be a hassle or boring. In order to give it your best you will need to appreciate and enjoy this journey. I was blessed to work with a phenomenal online trainer, Steve Poynter (www.fitnesspoynters.com or Stevep78 on BodySpace) who created a meal plan and workout geared toward my specific needs.